The blog, "Watts Up With That?" has a nice feature on temperature monitoring stations and how the Urban Heat Island (UHI) effect works - and distorts the evidence that the earth is warming at an unprecedented rate (which it isn't). The Marysville station is located behind the fire department building on a patio and is probably the worst site visited so far. 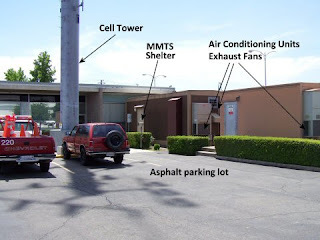 In addition to the sensor being surrounded by asphalt and concrete, its also within 10 feet of buildings, and within 8 feet of a large metal cell tower that could be felt reflecting sunlight/heat. And worst of all, air conditioning units on the cell tower electronics buildings vent warm air within 10 feet of the sensor. Oh and lets not forget the portable BBQ the firefighters use a "couple times a week." The area has been constantly added to, what was once a grass rear yard was turned to a parking lot, then more buildings added, then a cell tower with one, then two electronics buildings and the air conditioners...no report on how long the firefighters were BBQ'ing back there, when they figured out why I was asking all the questions they clammed up. Great pictures, too. Check it out. When compiling temperature records, NASA GISS are very aware of any possible Urban Heat Island effect and remove any spurious signals by normalizing urban stations to surrounding rural stations. Any stations with dodgy data are dropped. A study by GISS and NOAA examined the last century of temperature data across the USA and found any possible urban warming was small and fell within uncertainty ranges. When attempting to correct urban levels to match surrounding rural levels, they found 42% of cities were getting cooler relative to their surroundings due to urban areas being heterogeneous, and weather stations are often sited in cool islands. The point is they're aware of UHI and look for it when analysing temperature records. This confirms a peer review study by the NCDC that did statistical analysis of urban and rural temperature anomalies and concluded "Contrary to generally accepted wisdom, no statistically significant impact of urbanization could be found in annual temperatures... Industrial sections of towns may well be significantly warmer than rural sites, but urban meteorological observations are more likely to be made within park cool islands than industrial regions." Another more recent study (Parker 2004) published in Nature plotted 50 year records of temperatures observed on calm nights, the other on windy nights. He concluded "temperatures over land have risen as much on windy nights as on calm nights, indicating that the observed overall warming is not a consequence of urban development". A broader way to look at it is to compare a map of surface temperature rise for 2005 (the redder areas show greatest temperature rise) to a satellite photo of earth at night. The satellite photo clearly shows the heavily populated regions - North America, Europe, the east coast of South America. If Urban Head Island effect was exacerbating global warming records, there would be a correlation between urbanisation and warming. Instead, the regions of the globe with greatest temperature rise seem to be anywhere but the urbanised regions.